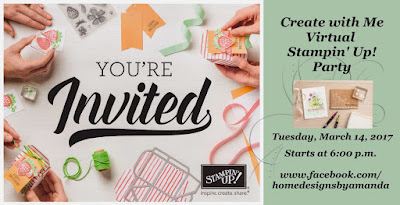 Mainly, I'm trying to get prepared for my FIRST Stampin' Up party...which happens to be a virtual party on my Facebook page. Click on the picture to take you right to my FB page! So, if you are free...or perhaps snowed in...tomorrow evening, why not come on over and join me for some fun! Thanks for stopping by, and I hope you'll come Create with Me tomorrow! Labels: Annual catalog, Facebook party, Psalm 88:2, Stampin' Up!